What follows can’t pretend to be much more than thinking out loud amid a mercifully quiet summer at Sheffield Wednesday. But I do believe Jordan Rhodes could be the key to what is expected to be minimal transfer activity. For all the squeeze of FFP, at least Wednesday have stayed within it and maintained a hard-headed approach to returning to the Premier League. You can’t put a price on that at a time when Aston Villa are engulfed by a financial crisis after missing out. Neither can you put a price on Rhodes in the sense of attracting an offer anywhere near the £8m the Owls paid for him 18 months ago. With hindsight, some will see that deal as reckless, although it made sense on the player’s record at the time. What’s logical now is that Rhodes requires a fresh start just as much as Wednesday need to create more room for manoeuvre. It’s clear some trading is required. Only the club knows the figures but speculation about listening to offers for Fernando Forestieri and/ or Barry Bannan seems extreme to me. You can’t imagine bids being welcomed for either, much as it’s only your best players who attract overtures. Other solutions are much preferable. A number of Championship clubs are linked with Rhodes – who wouldn’t consider a goalscorer of his pedigree? – and a loan is on the cards. This would come with a loan fee, which is standard these days, and the Owls being expected to subsidise a portion of the wages. The risk, of course, is that (barring a move to a League One big-hitter like Sunderland) Wednesday could end up helping a rival if Rhodes rekindled his form, although this could ultimately help his parent club as well. What seems clear, however, is that Rhodes is not seen as a first-choice striker by Jos Luhukay, who’s had ample time to assess him. As to the interest, it’s ironic on two counts. Nottingham Forest are frequently mentioned despite their manager Aitor Karanka finding no regular place for Rhodes during their previous association at Middlesbrough. 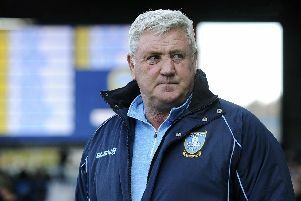 Then there is Villa, whose boss Steve Bruce was linked ahead of Rhodes’ move to Hillsborough. Villa would seem to be in no position to recruit him now. On the flip side, they need to offload some established players and have no shortage of good ones. . . coincidentally including Conor Hourihane, who is known to have preferred joining Wednesday before his switch from Barnsley to Villa Park. Hourihane may not attract Luhukay in the same way as his predecessor Carlos Carvalhal and Wednesday’s priorities are more geared towards a pacy wide midfielder and a strong enforcer amid doubts about the durability of Sam Hutchinson, who would otherwise be the first name on many people’s teamsheet. That said, Hourihane’s 11 goals from midfield last season is exactly the sort of contribution Wednesday are lacking from that area. Loan swaps will be under consideration this summer, if not necessarily this one. Rhodes could certainly figure in such an arrangement and, as a model professional, hopefully something can be arranged to everyone’s benefit.